Star Carr, situated just a little south and inland of Scarborough is a truly important archeological site beneath flat, peaty fields in North Yorkshire’s Vale of Pickering. It dates back to the middle Stone Age (or what is properly called the ‘Mesolithic’ period, 9500-4000 BC). In 2011 it received a long-awaited designation as a scheduled monument – unusual for Mesolithic sites – but reflecting its key part in telling the story of early Britons. During Star Carr time we were still very much part of the Continent, connected to modern-day Europe by an area called Doggerland (See this interesting article from The Guardian for example.) If this sounds familiar, you may have heard of the Dogger Banks, giving rise to the sea area quoted in the shipping forecast. Doggerland lies beneath the shallow waters of the North Sea: Not so much a land bridge to the Continent as a vast country of hills and river valleys in its own right, which supported hunting and gathering human populations and across which they migrated, following the large herbivores recolonising Britain after the ice sheets retreated and first tundra then forests spread over the denuded landscape. If Doggerland has piqued your interest, as it certainly deserves, search for the publications of Vince Gaffney and his team, who have written extensively on it. 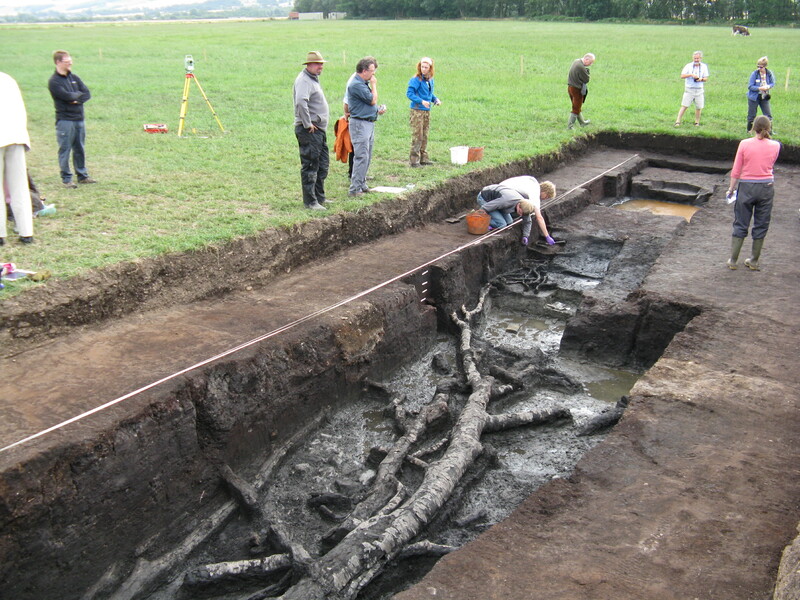 Star Carr is famous, among other things for evidence found in 2008 of the ‘earliest house in Britain’, a structure of timber posts around a shallow round hollow on what at that time was an area of elevated ground beside a lake shore. To call it a house is a bit of a stretch, but the clues – a series of post-holes, evidence for a hearth and indications from organic content of the stony soil that vegetation was used as bedding or matting – suggest this Stone Age hunter-gatherer’s dwelling was maintained over several generations. The lost wetland, coined Lake Flixton is itself a fascinating archaeological feature across The Carrs landscape. Centuries of reedswamp vegetation built up metres deep of peat over the lake bed and gave rise to the flat fenland appearance of the Scarborough Carrs. It is these very peat soils, waterlogged for thousands of years, which gave rise to the remarkable preservation of organic artefacts at Star Carr, including animal bone, antler tools and wood. Many artefacts have been discovered during archeological digs which have given rise to evidence of how people lived during this period. Barbed points, flint, beads of shale and amber and even early timber platforms have been discovered, showing that there are similarities between life in the past and today. These artefacts have been preserved for a very long time due to the water-logged peaty soils found on The Carrs; without it the artefacts would have decomposed and knowledge of how life was lived in the areas would not have been gained. However, this area of land has been extensively drained for use as farmland which has caused the peat to deteriorate in recent decades. Rapid chemical changes have arisen in the once-waterlogged sediments and consequently, artefacts that were once preserved in this environment are also deteriorating, highlighting the need to conserve the area and its history. The University of York has been conducting archaeological research into the site for a number of years and continues to publish new discoveries and insights from the most recent excavations. The Star Carr Project, led by Professor Nicky Milner at the Department of Archaeology in York has a great website well worth exploring, and covers a great deal more than I can cover here. I recommend you devote some time to look at it. Nicky has been studying Star Carr and related sites like Flixton Island since the late eighties and her team has a considerable reputation among the global scientific community studying the Mesolithic period. Remarkable artefacts which have been found at Star Carr over generations of archaeological digs since the site’s discovery in the late 1940’s are lodged in various Museums including London, Cambridge, York and Scarborough. A particularly nice installation at The Rotunda Museum, Scarborough features large artwork reconstructing the Star Carr landscape and even an immersive soundtrack composed to emulate the ‘soundscape’ of Star Carr.